I find the perfect crib for Madeline and Kirby! 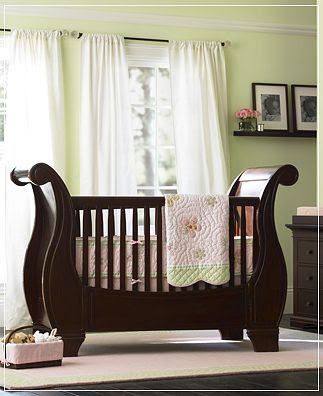 It's the gorgeous sleigh bed pictured below, from Pottery Barn Kids. In fairness to me, I wasn't just perusing baby accessories - HEAVEN FORBID - I was searching for the perfect shower gift for a friend of mine who is extremely Great with Child. "I found the perfect crib for Madeline and Kirby!" I announce to the DNB when he comes home from work. "Oh great, this is how it starts," he groans. I explain to him that I wasn't just perusing baby accessories, but in trying to find a gift for my friend ran across this most beautiful of baby beds. "How much is it?" he asks of the crib. "Umm," I hedge. "It's a conversion bed that becomes a toddler bed, too!" "That's great. How much is it?" Since when was he so persistent? "Why do you hate our unborn children so much?" I ask, frowning.